The day after President-elect Donald Trump takes the oath of office, as many as 200,000 people are expected to attend the Women’s March on Washington. Critics and some Trump opponents have cast the march as an anti-Trump protest, but organizers insist it’s a nonpartisan event aimed at advancing a specific policy agenda: expanding family leave, ending racial profiling, and maintaining or broadening access to abortion and birth control, among other issues. But even if the groups behind the march coalesce around a clear set of progressive goals, getting Congress and statehouses on board is anything but guaranteed. Republicans control both houses of Congress and will take back the White House on Friday, when Trump replaces President Barack Obama. Republicans also control both legislative chambers and the governor’s office in 24 states. That is why, to a large extent, women’s organizations are playing defense as they prepare for legislative battles around the country in 2017. O’Neill said the National Organization for Women, one of the Washington partner organizations for the march, would focus this year on stopping the repeal of the Affordable Care Act, protecting women’s rights to abortions, and preventing the privatization of Medicare. “We have really turned a corner as a country,” O’Neill said. Rolling back President Obama’s signature domestic law would harm millions of women and men, she added. Women’s rights groups and leaders on both sides of the aisle are watching the Affordable Care Act closely. Democrats don’t have the votes to stop the Republicans’ repeal effort, which is already underway. But former Rep. Connie Morella of Maryland said some of the law’s key components, such as the ban on charging more for women’s health care and access to contraceptives, could be included in the replacement plan. Morella, who worked on reauthorizing the Violence Against Women Act and establishing the Office of Research on Women’s Health, said she was optimistic that compromise was possible. Missy Shorey, the executive director of the conservative women’s group Maggie’s List, argued that Republicans would be open to a health care overhaul that keeps women’s health care in mind. The debate “will be quite loud and quite public,” Shorey said. With activists and lawmakers on both sides of the debate engaged on the issue, “I hope that we can be united and come together to move forward,” she added. Other economic issues could also lead to areas of compromise. Morella said that Trump’s focus on jobs could benefit women who are struggling to get by, if he implements measures that benefit workers left out of the economic recovery. “I think you have to look at people at the margins, and some of those people are the ones who voted for Trump,” Morella said. But finding agreement on some concrete issues, like paid family leave, could be more complicated in the months and years ahead. 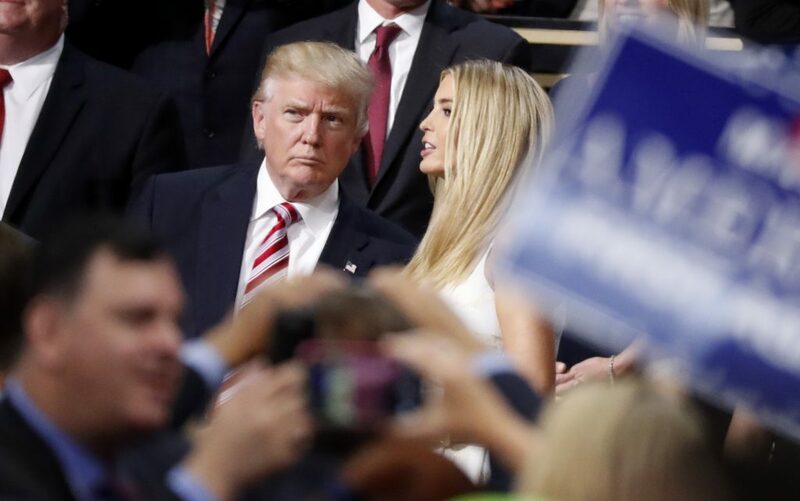 The president-elect is already moving ahead with a controversial proposal, spearheaded by his daughter Ivanka Trump, to create a child care tax credit and a six-week maternity leave plan for women whose employers do not offer such benefits. The plan has the support of several female GOP lawmakers. What it lacks is the backing of many women’s groups who argue that the proposal is based on a notion of family life and parenting that is stuck in the 1950s. In other words, the plan is a nonstarter for some on the left. The same could be said of more progressive efforts like passing an Equal Rights Amendment, which is one of the main goals of the groups behind the women’s march. “Oh forget it,” Morella said. “It would be lovely to have it passed. I’m 100 percent for it. But I just don’t see that” gaining traction in Congress, she added, especially if lawmakers focus on issues like family paid leave. While many Republicans and Democrats sounded alarm bells over the Trump presidency’s potential impact on women, supporters argued that many of their concerns were premature or overblown. But critics, especially groups outside of Washington, don’t seem convinced. Across the country, organizers have planned 248 “sister marches,” in all 50 states, which are set to take place on the same day as the main event in Washington, D.C.
That kind of solidarity is a key component of grassroots campaigns, said Sarah J. Jackson, an assistant professor of communication studies at Northeastern University. In Georgia, 10,000 people are expected to participate in the Atlanta March for Social Justice and Women. Co-organizer Aisha Yaqoob said her goal as a female Muslim was to connect attendees with local organizations working on women’s and civil rights. “We want people to know that we have hundreds of thousands of people to support you in the next four years, the next eight years,” she said. Organizers of the Women’s March on Oklahoma, which is expecting more than 2,000 attendees, have more specific policy goals in mind. “Our three main policy directives fall under health care, women’s economic empowerment, and domestic violence,” said Lindsey Kanaly, the march’s lead organizer. The group wants to boost the percentage of women in the Oklahoma legislature, for example, stop lawmakers from passing laws restricting abortions, and reduce the state’s female incarceration rate, which is the highest in the nation. “Regardless of who takes office every four years in Washington D.C., there are some real things here in Oklahoma that need to change,” Kanaly said. 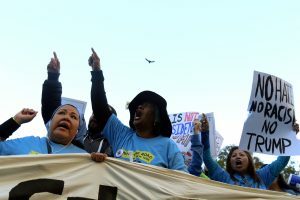 But organizers in Washington D.C. and across the nation admitted that keeping people motivated to remain active after the march would be challenging.